I've been subscribe to Globe Tattoo@home 4G LTE Wimax for Php 1k amonth.It's a 2Mbps connection which I believe is too much as a home user. Unfortunateky, I am able to have intermittent speed as shown on the screenshot. 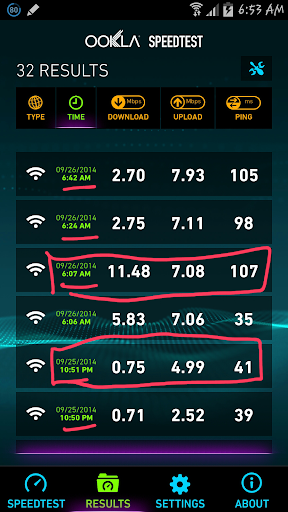 Notice that I can attain 11mbps in the morning and .57Mbps in the evening. I already reported this to Globe customer service for about a month long but still they cannot figure out what is wrong. All I can see is that the signal strength at ok.5 bars indicating that I got a nice reception. I only have negative value in terms of RSQP (dbm) of -78. During the test conducted, I only have my Samsung Note 3 connected.To have a flat test every morning and evening. If the case worsen I might have to asked them to cut this and change to smart lte fir good.